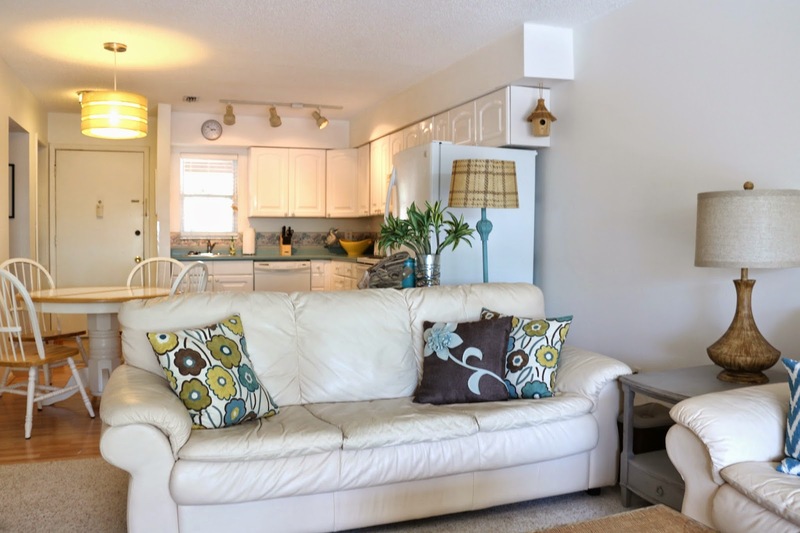 HOUSEography: Our Florida Beach Condo - Mini-Makeover Reveal! 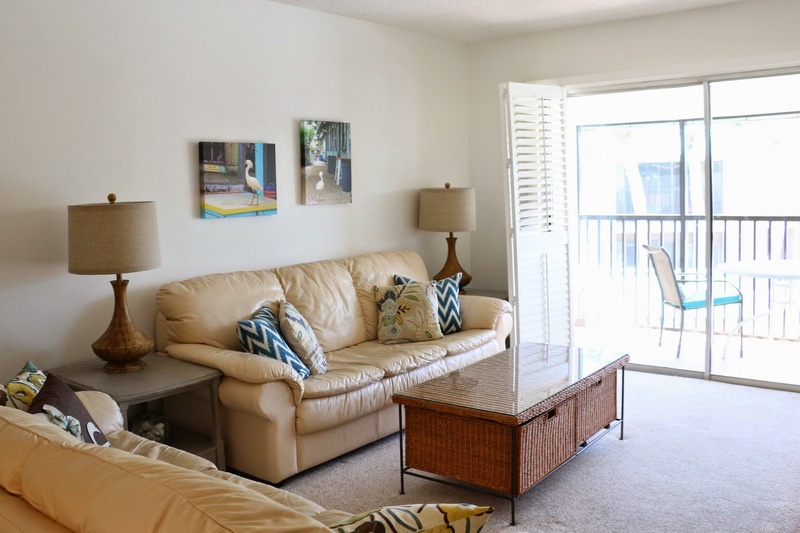 Our Florida Beach Condo - Mini-Makeover Reveal! 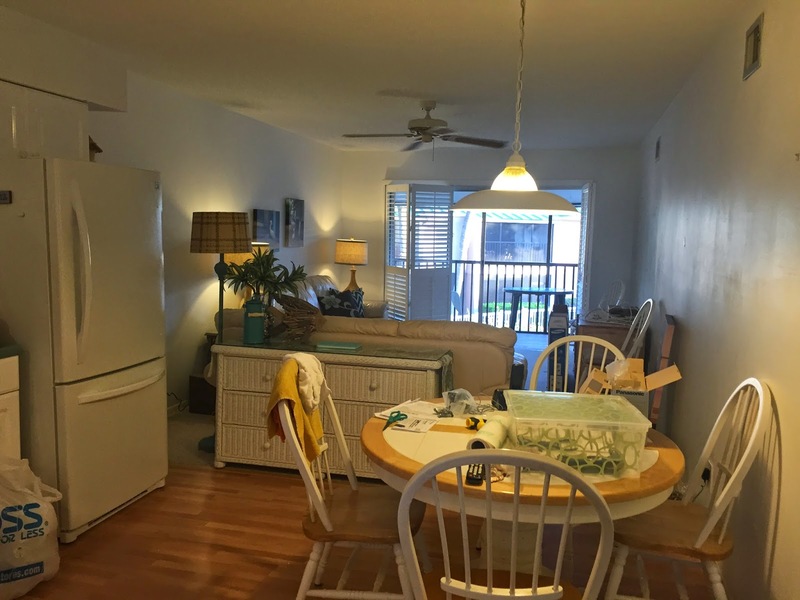 Last week I detailed how we bought and cleaned out our beach condo. Now I'll tell you how we put it back together in 30 hours with not a minute to spare! Literally - I was dragging boxes to the dumpster at 3:05 having just locked the door behind me! Fortunately my parents were there every step of the way and I am so thankful for them because this would NOT have happened without them. So, here's where things were when we left off at the end of "Day 1" - BLEAK! 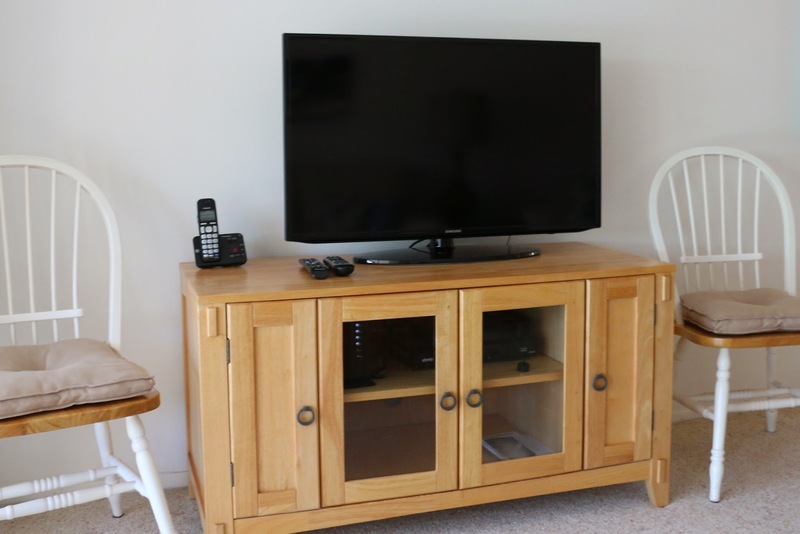 Throughout the 30 hours I kept thinking about all of the HGTV and DIY network design shows and how they always seem to do so much in a 2-day makeover. Of course, having an extra 10 hands and a decent budget really helps out. I had 5 pairs of hands (my parents', my kids and me) but 2 sets were pint-sized and only one of those was remotely helpful. To add to the fun HGTV was filming an episode of Beachfront Bargain Hunt - NO JOKE!!! I definitely lost 10 minutes of work time staring at them filming by the pool (our unit has a nice pool view fortunately!!). Of course I forgot to take a picture of them filming. My mom and I did an early morning trip to Comcast (argh!) and Lowes. 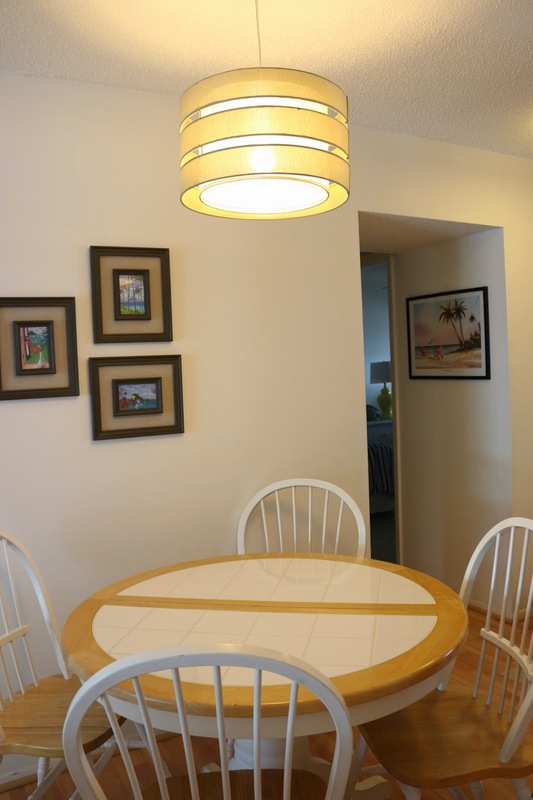 When we got back, my dad swung into action very early with setting up the TV and changing out 2 light fixtures (the entry and dining room - both HORRIBLE as you can see in the photos above) and some other odd jobs around the house. I spent 45 minutes dealing with Comcast hook-ups (argh!) and then putting things away that we had bought on our shopping spree the night before (cookie sheets, frying pans, utensil organizers, etc.). My mom and Elizabeth started making beds and unloading the dishwasher with all of the dishes, glasses and bakeware we were keeping (but which definitely needed a trip through the dishwasher!). As I was finishing a bunch of little things including a final clean-out of the kitchen drawers and cabinets, my mom scrubbed the bathrooms and vacuumed everything. Ideally we would have scrubbed down all of the baseboards behind all of the furniture but we did what we could in the time we had. I'll do some more cleaning when Handy Hubby and I go down in May. He will finally get to see what we bought! Then we started hauling all of the trash out. A. LOT. OF. TRASH. 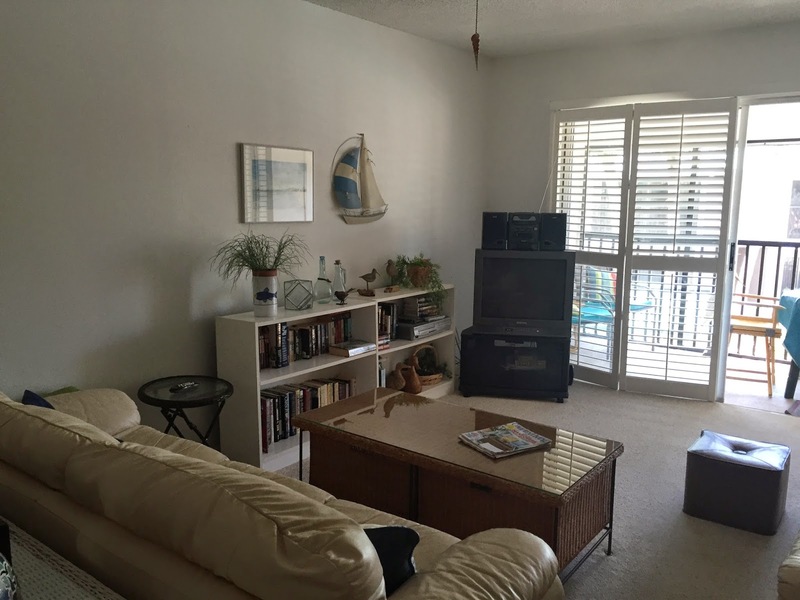 The very last thing I did was take pictures for our rental website. Here are the "after" pictures after 30 hours of hard labor! I should note that we did not even lift a paintbrush during that time so everything here was done with accessories and cleaning out! I wish I had taken before and after pictures of the cleaned out closets but I'll try to do those in a future post. I flipped the room layout so the couches are on the left and the TV on the right side. You may recognize some of these pillows from our own family room. I recently scaled back on green so these pillows weren't working here but they are perfectly tropical for Florida! The pictures over the sofa are my own. They were taken of some birds at the famous New Pass Grill & Bait Shop (a really fun place if you are ever on your way to or from Mote Marine!). The lamps were an AWESOME score at Ross Dress for Less. If you hit that store on the right day, you can get amazing lamps for even less than Marshalls and HomeGoods. Normally this happens when I'm not looking for lamps but this time it worked out perfectly! 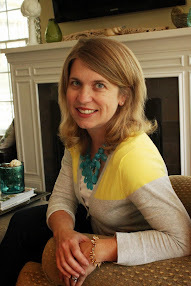 The floor lamp behind the sofa was a curbside find painted with chalk paint with a shade that I had from another lamp. Totally free -love that! My parents did some heavy negotiating for the TV stand in a yard sale (one of their favorite pastimes). I might make some changes to it at some point to make it even more functional, such as removing the VCR tape holders in the side cabinets. It is incredibly heavy so we were fortunate to have some help from my parents' neighbors. 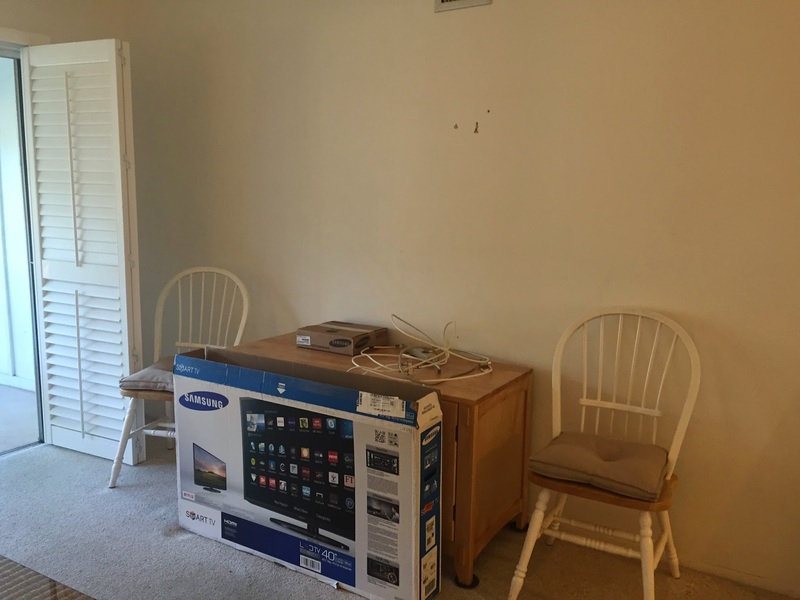 I also have some ideas for decorating the wall behind the TV which is almost completely bare right now. Short term I'll get rid of one of the sofas and we'll try to move two club chairs we already own from Arlington to Florida (like in my dad's boat this fall!). 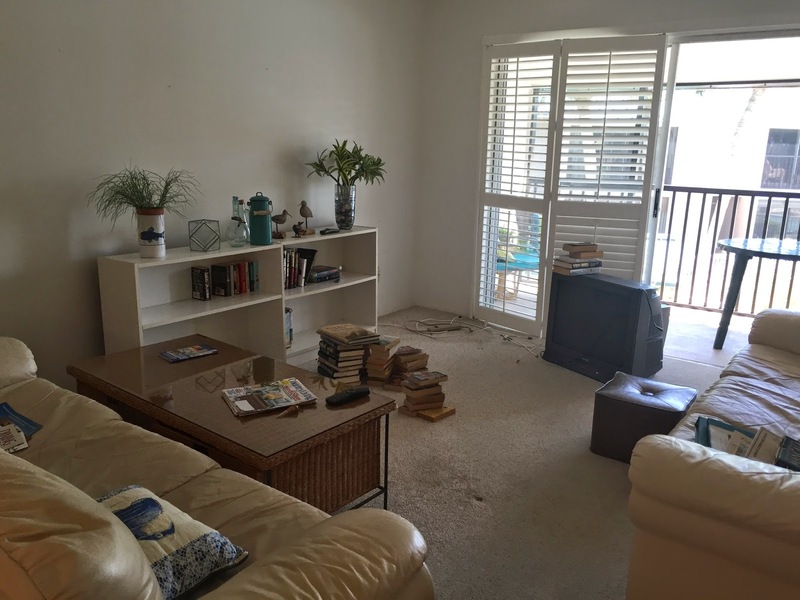 I also need two smaller chairs next to the TV - perhaps slipper chairs or some other chairs. I'm not sure yet. I definitely want to get rid of those dining chairs in there for sure. Not many obvious changes to the kitchen. The wallpaper border/backsplash is coming down ASAP. 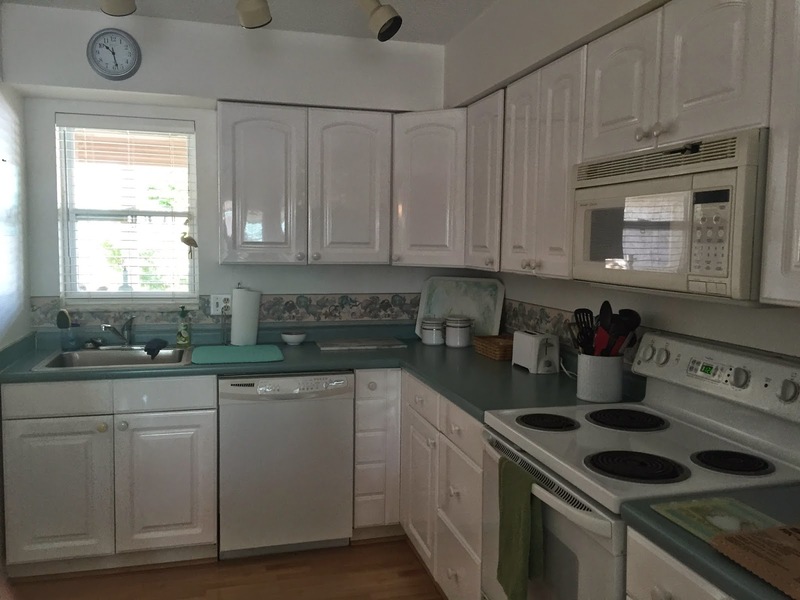 I hate it and it dates the already dated kitchen twofold. I was hoping to have time last week but that was not in the stars. I'll get rid of it in May and take new pictures. I added the big yellow bowl in the corner that guests can use for serving pasta or just keeping fruit, snacks, or baked goods on the counter. I also bought a stainless steel utensil holder, a knife block (there were almost no knives at all! ), and a new toaster. 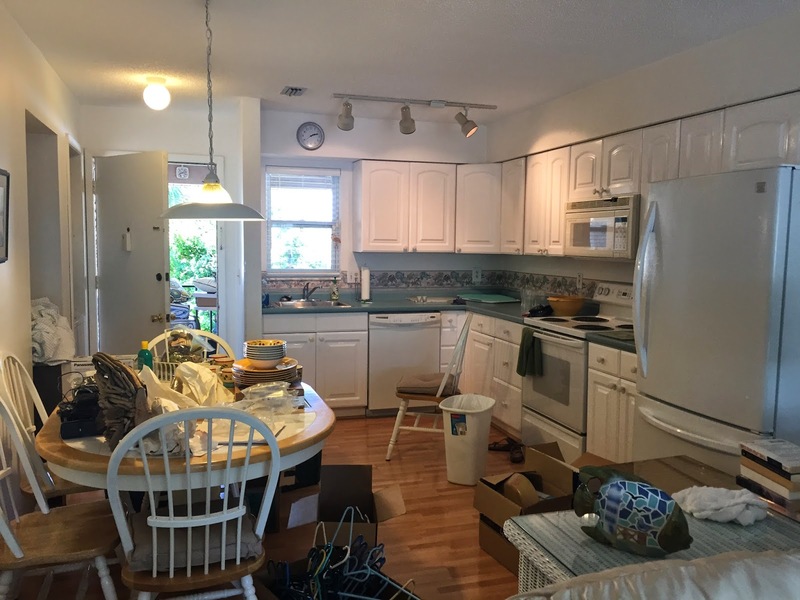 Before last week I probably would have told you that we are going to rip out the kitchen in 5 years but after spending some time there, I really liked it and the cabinets were all in good shape except for the doors. If we could get new doors, that might be the best solution. I might also add some crown molding to dress-up or hide the soffit. 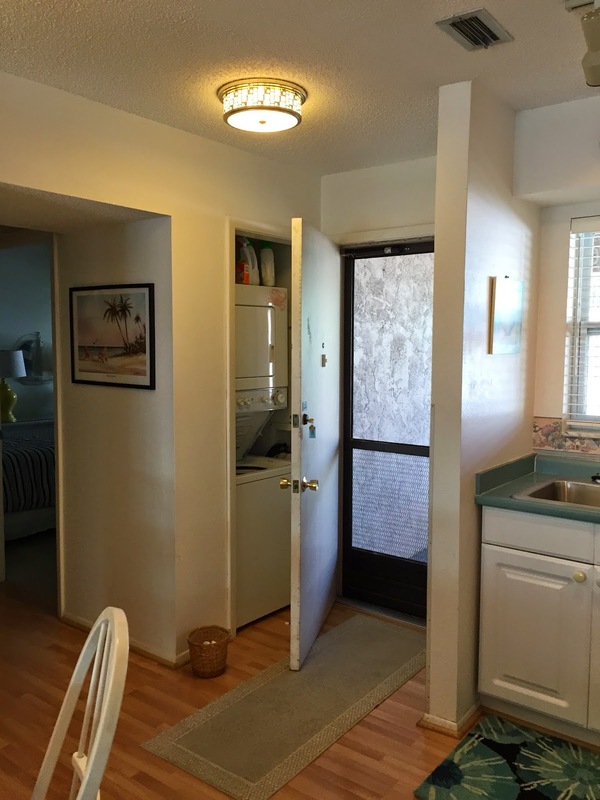 All of the appliances are decent and the fridge is quite new. We might be able to get away with a less-expensive makeover with new doors, counter and backsplash. Here's the dining area before. The main change here was a new drum light that we bought at Lowes for $90. It is the perfect natural color to compliment the flooring and shades on the living room lights. That old fixture was a rusty 1980s relic that was hanging right in your main view when you walked through the front door. I wish I took a picture with the new light off so you can see the color, but I was in a bit of a rush at this point! I also put up the new art on the walls. These are notecards purchased from a gallery in Nevis on vacation in 2003. I picked up the frames on clearance at Walmart that morning! I'm going to think some more about what to do with the table and chairs. They are not horrible and will be fine in the short term. I took the leaf out and stored it in the closet so there is more room to move around in the kitchen. When we redo the floor, I'll decide whether to replace them with a high top table or an island with stools. 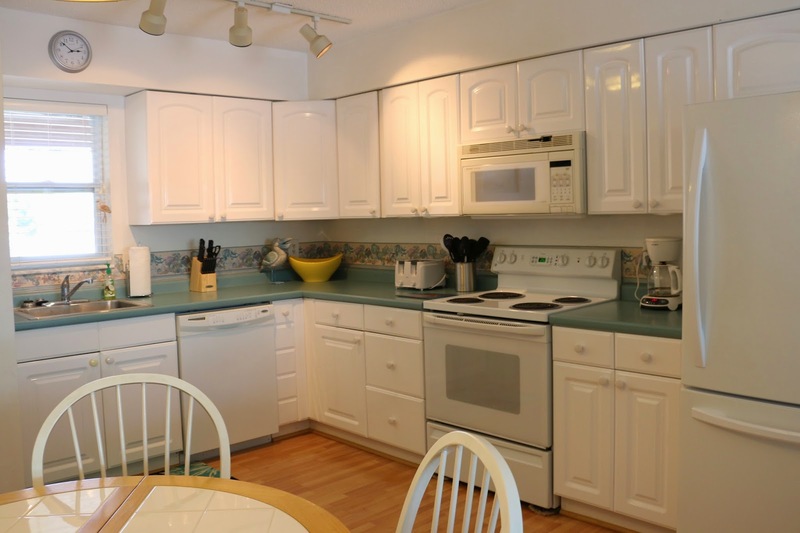 That would make this kitchen a really great cooking and entertaining space, especially given the size of the condo. The main theme in these rooms was cleaning! There was dust on every service, old shelf paper in the drawers, and the closets were a mess. 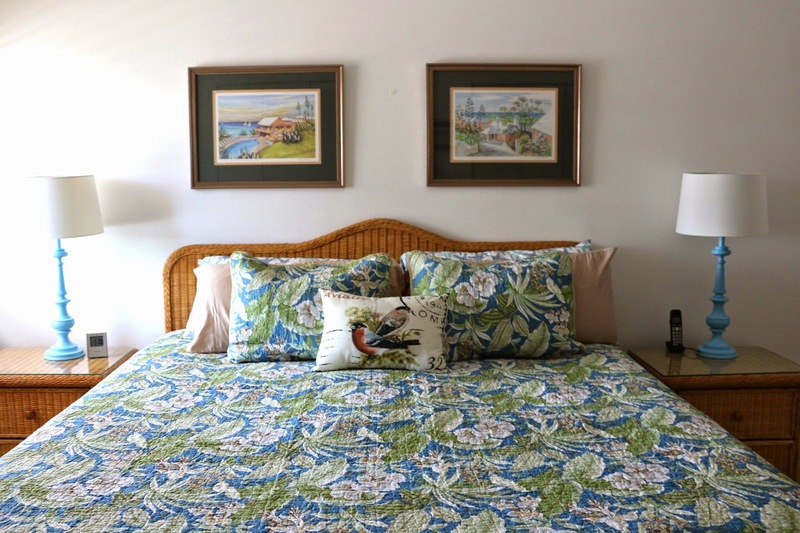 I replaced the bed linens with a Tommy Bahama quilt and shams (found at Ross of course!). I bought all new sheets and my mom got the bedskirt from another Florida friend who was redecorating. The lamps on the bedside tables used to reside in our basement family room. 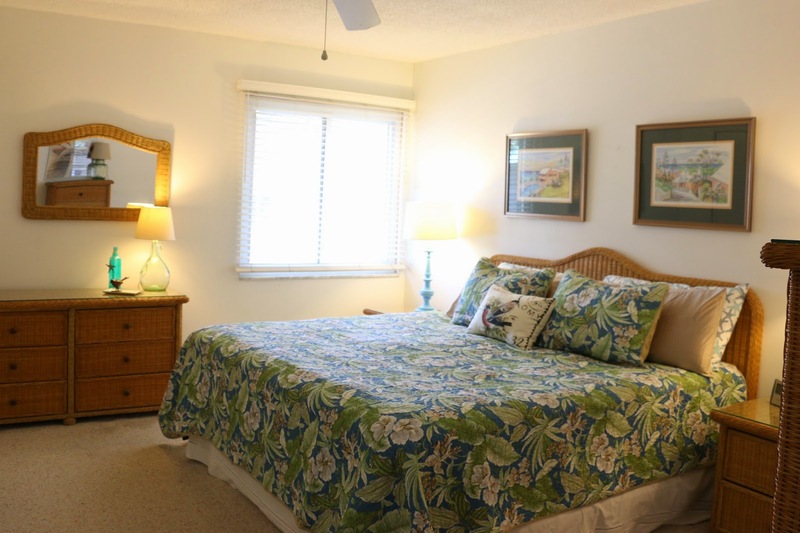 The pictures on the wall over the bed were purchased on our honeymoon in Bermuda and used to be in our own master bedroom. Everything else was in the condo already. I love how this room turned out considering the changes were not monumental. It needs a new ceiling fan and maybe a different dresser on the right wall (not shown in these pictures) or perhaps a desk or console instead. The furniture is good quality though so I'm not going to be quick to get rid of it. 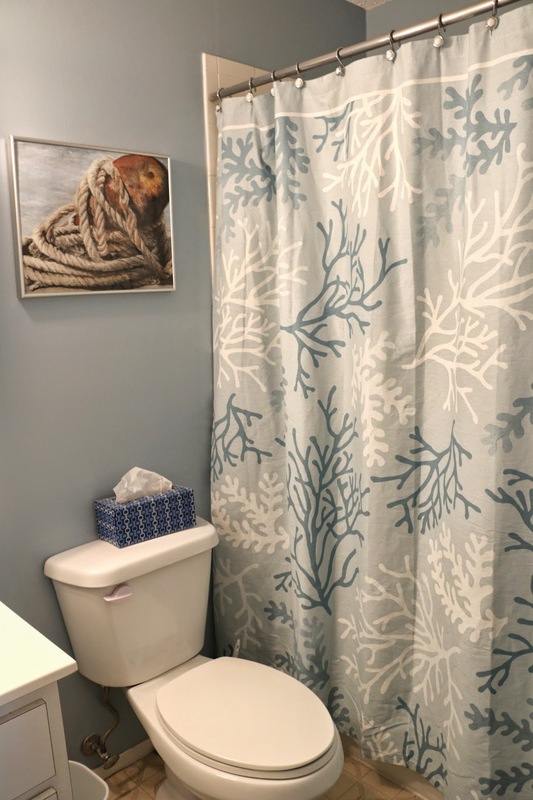 The master bathroom was already painted a pretty blue that perfectly matched the shower curtain that I had brought with me! The art on the wall was another mom yard sale find. It might need a new frame but it's getting the job done for now. This room is probably most in need of a makeover in the next few years. The vanity and medicine cabinet are a little rough and the floor is not at all salvageable. The tub could also be replaced with a step in shower making it easier to get in and out safely. 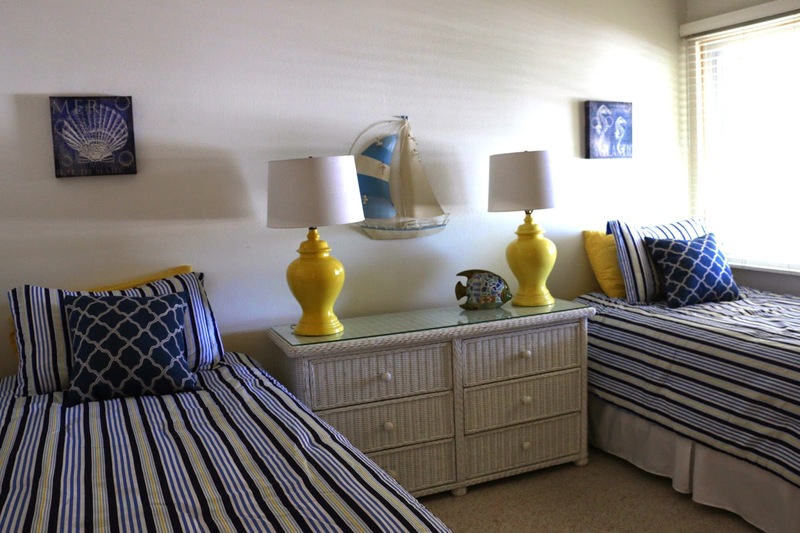 The guest bedroom was one of the more dramatic makeovers in the condo. It was functional before but had no character. Now it looks really cheerful and nautical. My kids cannot wait to sleep here - no idea when they will! I purchased the Tommy Hilfiger comforters at Ross (of course!) and the ocean art was also a Ross find. My dad (!) salvaged those yellow lamps on the curb from a condo neighbor on the day we were moving in. He came in at one point on Tuesday and said, "Hey Meliss, there are some yellow lamps on the sidewalk that are being donated to the yard sale unless you want them." I bolted outside in a flash and did a little jig because they were so perfect. New crisp white drum shades from Lowes for $12 each were the finishing touch. I think they make the room. One of the reasons we jumped on this unit so quickly was that it has a washer and dryer. It's small but fully functional. We also replaced the horrible little globe fixture that was here before. It was completely dated and only had one lightbulb. This one provides great additional light in the entry and it was on clearance at Lowes at 7:30 a.m. that morning. It was not at all in the original plan and Handy Hubby would have disagreed but he wasn't there. But, since we replaced the pendant right next to it, the originally ugly globe looked much worse! Finally our little screened lanai is a great place for morning coffee and dinner at home. There was an old plastic table here so we bought a new basic glass table. The chairs were already here. That's the end of the tour! We are looking for renters. 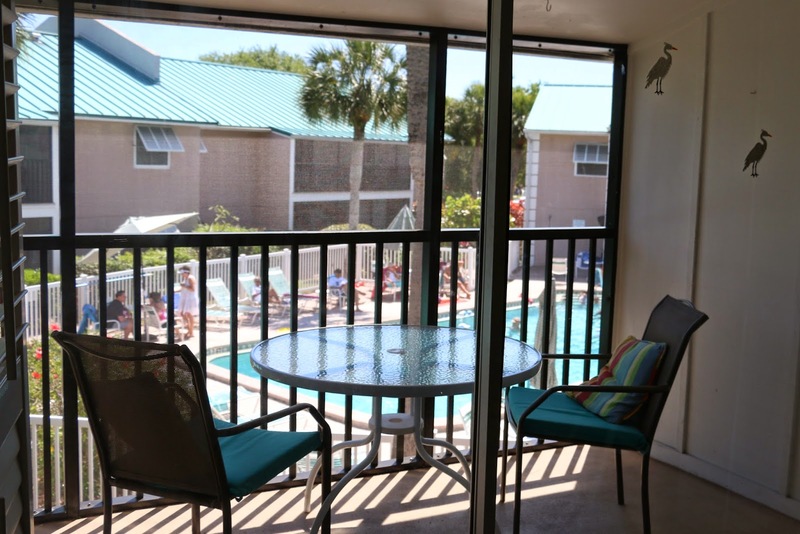 If you or someone you know is looking for a place to vacation this summer or fall, please call 1-800-944-5629 and request unit 706. 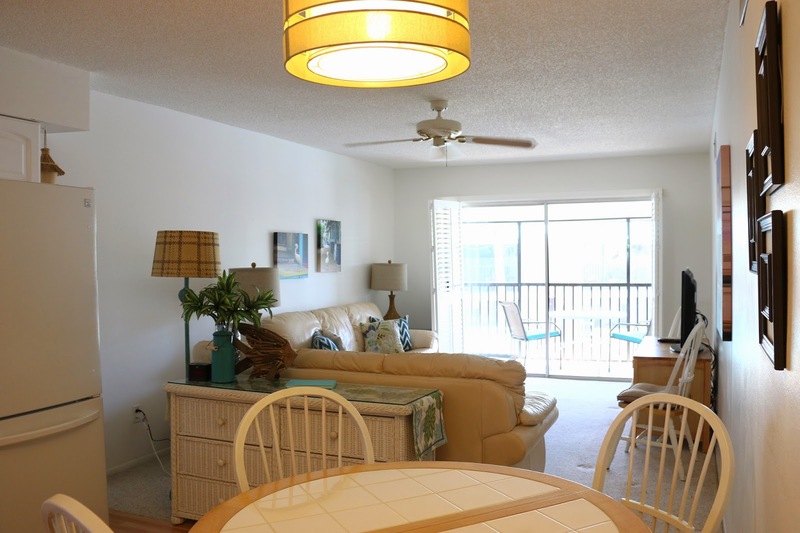 There's a two-week minimum but prices are very affordable in the summer and fall!